. Published on Tuesday, May 9, 2017 . With more than 3,000 reviews on Yelp, you know you’re in for a special treat. 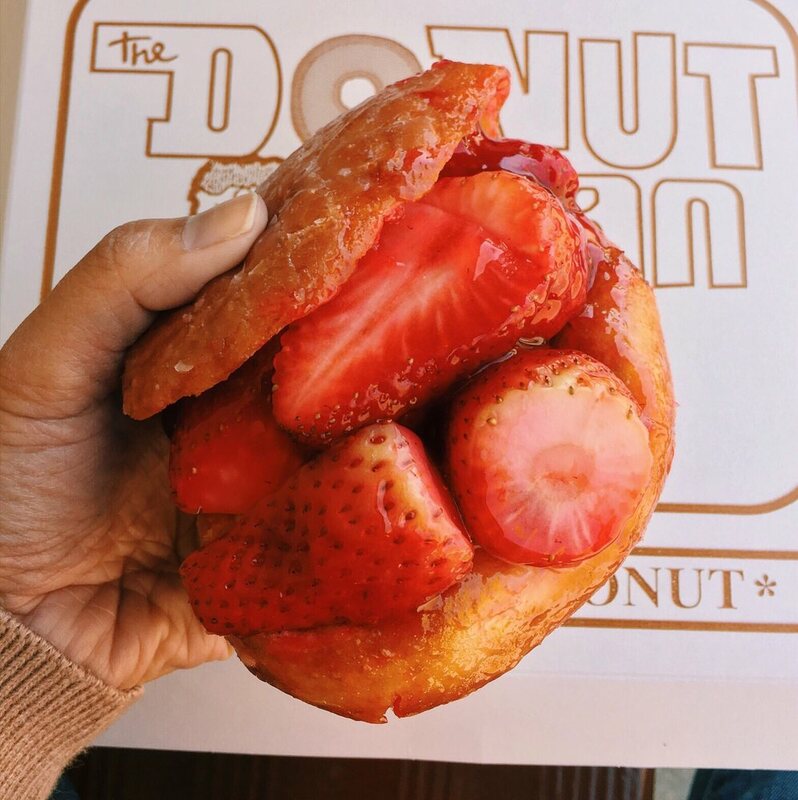 The Donut Man, which is located on historic Route 66, is known to draw in crowds for their seasonal strawberry donut (pictured above). Once you try it, you’ll never crave another donut. Keep in mind that this spot is open 24 hours, and is located near Azusa Pacific University and Citrus College, so don’t be surprised to see your fellow stress-eating college students lingering in the parking lot. Also, be sure to pull out some cash before visiting since this location is a cash-only establishment. When a donut is your friend, you’re in good hands. Whether you opt to customize your own donut or pick from their pre-made combinations, you can’t really go wrong with these vegan donuts. Yup, that’s right…VEGAN! And I guarantee you won’t be able to tell the difference. But if you really feel like indulging, be sure to try their Taking Back Sundae or Motion City Sandwich. You can even check out their menu before visiting by clicking here. Fruity Pebbles on a donut and cute panda looking donuts made out of Oreos? Count me in! This destination is full of tasty, colorful and aesthetically pleasing treats, so if you’re looking for Instagram-worthy food photos, this is your spot. But beware, this place is known for its long lines even though it’s open 24 hours, so be sure to bring your patience along with your sweet tooth. What do you get when you combine a donut and a croissant? You get a cronut. And if you haven’t tried one, it’s time to taste this hybrid game changer. I recommend trying the Nutella strawberry, strawberry cream and Oreo cream cronuts. Yes, all of them. As for their classic donuts, their blueberry donut is a must. Is your mouth starting to water as you read this? Don’t worry, they’re also open 24 hours. If you’re ever in the Santa Monica area, be sure to stop by this donut hot-spot, which is also known to dish out a satisfying cronut. My personal favorite is the Nutella with banana cronut. But you can’t leave without trying their famous Ube donut, so be sure to bring an appetite. And if you really feel like eating something mesmerizing, don’t leave without grabbing a galaxy donut. It truly is out of this world. What are your favorite donut spots? Let us know by using the hashtag #CampusCropChat on Facebook, Instagram and Twitter. Don’t forget to follow us on Snapchat @ASICPP!